For dead NPCs named "Bandit", see Bandit (dead). For other uses, see Bandit (disambiguation). 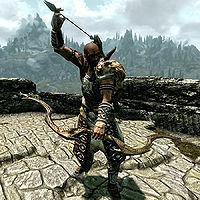 Bandits are rogue lawbreakers living a life of plunder and are one of the most common enemy types in Skyrim. You will typically find them in camps, some of which are marked on your map, and some of which are unmarked. Of the marked locations, bandits often inhabit both the interiors and exteriors of fort-type and other structures. Although most bandits will attack you on sight, some may attack only when you get too close. Still others will demand that you pay them and attack if you refuse. 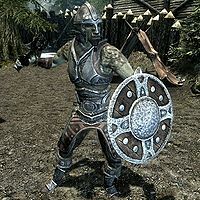 Bandits can be members of any race (except Altmer), and may be spellcasters, archers, one-handed melee fighters, or two-handed melee fighters. While the stronger bandit types will not appear until after you've reached the levels shown, you will continue to meet low-level versions even at high levels. Boss-level bandits will always be at the highest possible level, and will normally be identified as "Bandit Chief". Bandits of each type may vary in the combat equipment and style they use. Normal Bandits are generally fairly easy to kill, while Bandit Chiefs and Marauders are tougher. Unlike other Bandit Marauders, Bandit Marauder mages (bandits with the Bandit Wizard class) begin appearing at level 24. All bandits also carry a random assortment of items, which include beverages, lockpicks, food, jewelry, gems, tools, ingots, and a small amount of gold. Bandit Plunderers and Marauders carry more gold and may carry additional lockpicks. ^1This male Redguard bandit (EncBandit01Melee1HRedguardM) also appears in the list of level 1 archers (SubCharBandit01Missile), but has all the stats and inventory appropriate for a one-handed weapon fighter. ^2These Bandit Highwaymen are actually set as level 0, which means they have lower health and stamina than other bandits that appear when you are the appropriate level. If Dragonborn is installed, their level and stats will be corrected (hover to see values). 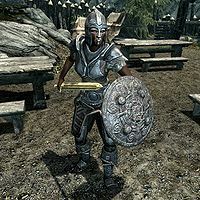 Two-handed melee bandits also carry a small amount of gold and have a chance to carry a few lockpicks. 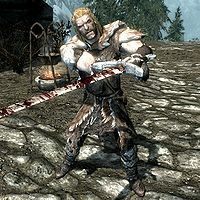 Bandit Plunderers and Marauders carry an orcish dagger and have no lockpicks. 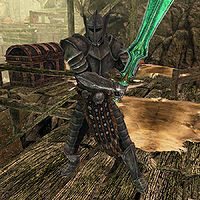 ^1These two-handed melee bandits appear in "berserker" leveled lists; they are identical to other two-handed fighters, except that they have a morality of No Crime instead of Any Crime and have the csHumanBerserkerLvl1 fighting style instead of csHumanMeleeLvl1. ^2SubCharBandit01Melee2HBerserk and SubCharBandit02Melee2HBerserk contain the same list of bandits, which means the berserkers that appear in the level 1 list also appear in the level 5 list (with stats and perks appropriate for level 1 bandits). This bug is fixed by version 1.2.7 of the Unofficial Skyrim Patch. 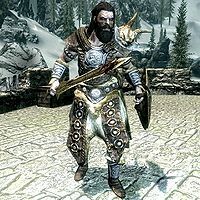 Archers carry the same miscellaneous loot as their one-handed counterparts, and also have a small chance of carrying additional arrows of any type (including glass, ebony, and Daedric). Archer Bandit Plunderers and Marauders carry more gold than those at lower levels. ^1This male Redguard bandit (EncBandit01Melee1HRedguardM) has all the stats and inventory appropriate for a one-handed weapon fighter, and also appears in the list of level 1 one-handed melee bandits (SubCharBandit01Melee1H). ^2None of the Khajiit archers can actually appear in-game as they never got added to the respective leveled list. This bug is fixed by version 2.0.4 of the Unofficial Skyrim Patch. Bandit and Bandit Outlaw mages carry an iron dagger, while Bandit Thug mages carry a steel dagger. 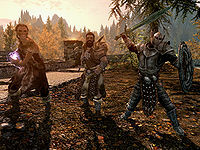 Bandit Highwayman, Bandit Plunderer, and Bandit Marauder mages carry a leveled dagger (iron, steel, orcish, dwarven, or elven). In addition to their gear, bandit mages carry a random assortment of items, including lockpicks, food, jewelry, soul gems, ingredients, books, spell tomes, a leveled Conjuration or Destruction staff, and a small amount of gold. 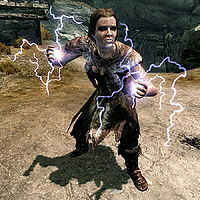 Bandit Plunderers and Marauders carry more gold and have a chance to carry additional lockpicks than lower-level mages. ^1"Magicka Recovery 2" is a 0 magicka cost spell with the effect "Recover Magicka, 2 pts." This spell is available to NPCs only. ^2Bandit Marauder mages begin appearing when the player is level 24, rather than level 25 like the other bandit types. The enchanted weapons listed above will have either fire damage, frost damage, shock damage, magicka damage, or stamina damage enchantments. The strength of the enchantment will vary depending on the level of the item. In addition to the equipment listed above, all Bandit Chiefs carry a leveled amount of gold. ^1This Bandit Chief is missing the Bone Breaker and Skullcrusher perks. ^2These Bandit Chiefs have LItemBanditWeapon2HBoss instead of LItemBanditBossWeapon1H, so they actually carry two-handed weapons. ^3This Bandit Chief has only 282 health instead of 395. ^4Bandit Chiefs at this level should have an elven dagger, but this one has an orcish dagger. ^1This Nord bandit chief has a higher magicka value of 40 rather than the standard 25. Mistwatch contains a group of bandits called Mistwatch Bandits; these location-specific bandits can be either one-handed melee fighters, two-handed melee fighters, archers, or mages, and have the same stats and perks as their ordinary bandit counterparts. They are all members of the Mistwatch faction, and will no longer be hostile towards the player should the Mistwatch quest be completed in Fjola's favor. Infiltration: Help Stalleo take back Treva's Watch. Mistwatch: Help Christer locate his kidnapped wife Fjola. Silver Lining: Recover a stolen silver mold for a silversmith. The Pale Lady: Find out what happened in Frostmere Crypt. If you speak to a bandit who is leaning against a wall, typically guarding the outside of a hideout, they may give a generic, non-hostile response (such as "You need something? "), although after a few seconds they will draw their weapon and attack. 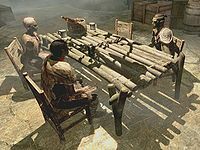 Male bandits will talk to themselves while idle, but they do not talk to each other unless scripted by a certain location [verification needed — verify males only]. "...retire some day... get myself an island..."
"...never enough gold... just need one good haul..."
"...might pay off my bounty this time... walk into the city a free man..."
"...told him to just hand over the gold, but did he listen? Oh, no... they always have to fight back..."
"...I'll never do another span in that stinking jail... rather die than give myself up..."
"...he he he... two threes? What was he thinking? Fool never saw me pull that ace out of my boot..."
"[Sighing] ...need me some Skooma... the imported stuff... just one last time..."
"...gonna start keepin' a knife in my boot... tired of gettin' disarmed..."
"...should have known she was lying... said she'd wait for me... but they never wait..."
"...lyin' little harlot... that brat ain't mine... could be anyone's... won't get one rusty septim from me..."
"..."go to the college" da said... "use your smarts" he said... like I'm supposed to figure out which college he meant..."
"...hmph, wizards... Now that's power... Bet they got that "secret" magic... can turn wood to gold... yeah... Wish I could turn wood to gold..."
"...mead, mead, mead... kill him to get some beer every now and then? Stupid bees and their stupid honey..."
"...picking pockets, now that's the real art... ...no rough stuff, just take it and go... ...hmph, don't sound like much fun, though..."
"[Singing] ...once was a woman, as fair as an evenin', of springtime in old Stros M'Kai..."
"[Singing] ...with three beers down, the Orc did frown, and bid the Elf goodbye... ...for none could know, 'twas not for show, and someone had to die..."
"...kill 'em, he talks to me again like that... get him when he's sleeping... or poison his meat... see how he likes that." "Never should have come here!" "Lookee here. Looks like we got ourselves a hero." "You picked a bad time to get lost, friend." "Now ain't this a surprise." "Go ahead, try and fight back!" "Die already so I can take your stuff!" "Whatcha gonna do? Huh? Whatcha gonna do?" "Gonna split your belly like an old woman's purse!" "You'll be so much easier to rob when you're dead..."
"Tell you what. You start running so I can stab you in the back." "Can't wait to count out your coin..."
"What...? Whoever did this, you're dead. You hear me? Dead!" Bandits encountered in Skyrim are generally twice as likely to be male than female. In most cases, the leveled lists that spawn bandits list each male bandit twice (except Khajiits) and each female bandit once. Most bandits have a morality of "Any Crime", which means they're willing to commit any crime. Bandit Chiefs and the "berserker" variety of two-handed fighters, however, have a morality of "No Crime," which means they are unwilling to commit crimes of any sort. Their aggression is the same as any other bandit, though, so they will still attack you on sight. Bandits that spawn within the exterior zone of Treva's Watch are set to spawn at a normal leveled list corresponding to your game level. However, bandits which spawn within the interior zone are set to appear 5 levels earlier, which means that at lower levels you will more likely encounter Bandit Marauders, etc. There is a bandit imprisoned in Ravenscar Hollow who has been locked up by hagravens and will ask you to free him. If he survives the fight with the hagravens, he will demand all of your belongings and you will be forced to kill him. This bandit is one of the few with whom you can exchange more than a couple of lines of conversation. For dead NPCs named "Bandit", see Bandit (dead). For the bandit enemies added by the Divine Crusader Creation, see Bandit Thief. For a list of locations where bandits are found, see this category. For unmarked bandit camps, see Unmarked Places. This page was last modified on 18 March 2019, at 23:15.